I drove home from the Monarch Chesterfield Levee Trail, and landed in my favorite easy chair. I was thrilled to have pulled off my longest distance in a couple of months. After sitting and watching a little bit of the Olympics, I decided I couldn’t stand my own stench and needed to grab a shower. When I got out, I checked Facebook, and saw that my next door neighbor Joe had two tickets to the Paul McCartney concert at Busch Stadium that night. I commented that if Becky were in town, I’d be all over that pair of tickets like… well, like the Beatles on vinyl. Just minutes later, my phone rang. Neighbor Joe told me that he’d bought the tickets a week or so ago, when Busch Stadium opened up some additional seating. Apparently, he’d thought to take a galpal, but at her ripe old age of thirty-something, the phrase “Paul who?” rained a little bit on his parade. But, having another music lover along who could appreciate this event rekindled his interest to go, and that he’d sell me one ticket, and drive us both to the show. I needed to be ready to go downtown in an hour. I’ve been a fan of the Beatles as long as I can remember. When I was a kid, I’d listen to my parents’ ginormous console radio, and hearing all kinds of tunes. That’s where I first heard The Beatles’ music. Fast forward a few years, and I was buying loads of Beatles and Wings albums, playing the grooves off the vinyl. I kept hoping and hoping that they’d reengage, even if only for a brief while. I watched as SNL waved a big ol’ check on TV to have them join together on their stage. I heard the urban legend that on one fateful night, they were all there, except George, who didn’t know his way around NYC, and didn’t get to SNL in time. And when Wings toured in 1976, I swore I’d get to one of the shows. I was 12, and just didn’t have the means or capability to get to Atlanta to see them. The closest I got was the Wings Over America album, which I listened to so many times that I knew every sound — music, lyric, audience — by heart. But when John was assassinated in 1980, that dream died. (Although, Julian Lennon sounded a lot like his father, and could’ve filled in, I’d thought.) And then after George’s death, it really cemented the truth that the clock was ticking, and if I was to see any of them live, I needed to move. In the early 80s, I saw a concert in Chattanooga that had The Producers as the warm-up band. The girl I was dating at the time and I waited around outside Memorial Auditorium before the doors opened, and ran to the front of the stage when we were allowed in. She and I were big ol’ Beatles fans, and during the show, we heard that lead-in note for “Hard Day’s Night,” and went nuts. I was pretty sure that was the closest I’d ever get to seeing anything by the Fab Four live on stage. Macca has toured many times since those days, and it’s just never seemed to work out for me to go and see him live. It’d always been a dream of mine to see him perform, and I knew one of these days, he wouldn’t be touring, and I would’ve missed my chance. When the tickets for this show went on sale many months ago, they were snapped up in no time — minutes! — and I thought that once again, I’d miss seeing Sir Paul live. 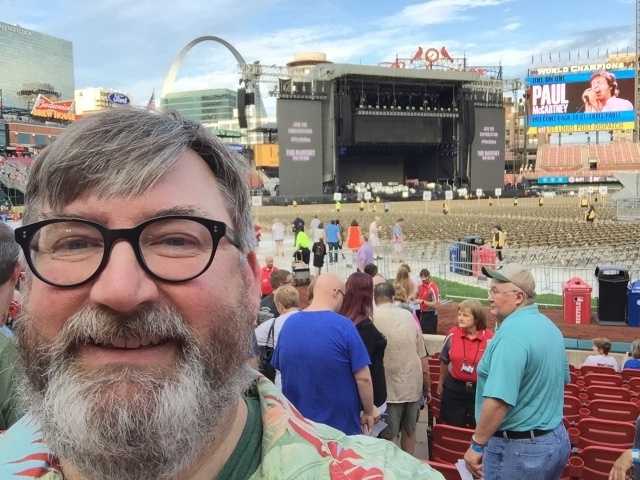 Neighbor Joe solved that with his timely tickets, and in an hour’s time, I went from not knowing what I was going to do Saturday night to riding downtown to see Paul McCartney! Being a native of Da Lou, Joe knows downtown, and knows where to park for events at Busch. He parked in a little out of the way lot near the Eat-Rite, and we hiked the short distance to the stadium. Standing outside the home of the Cards, we chit-chatted, and shared our joy of being there on Facebook. Quickly enough, the doors opened, we passed through security, and found our way down to the field. Yes, down to the field! 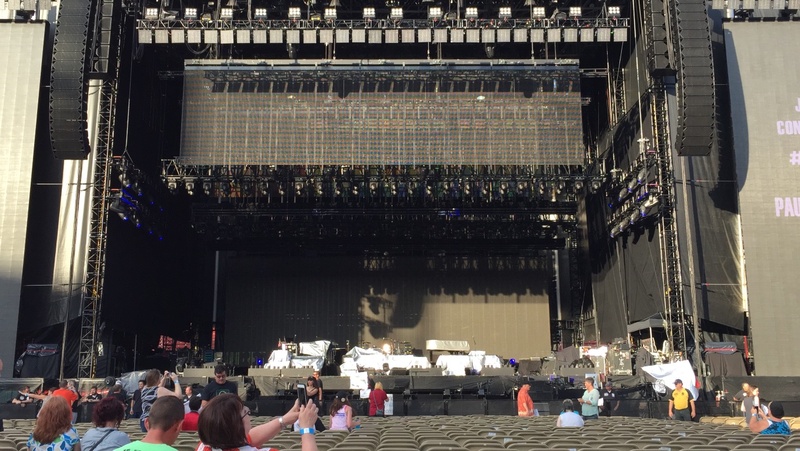 Joe had somehow scored tickets that were in the 28th row from the stage, dead center, and the view of the stage was incredible. It was the first time I’d ever been on the field at Busch III, and I was struck with just how big this place was. We were sitting in basically short center field, oriented toward the batter’s eye, so you could see all the seats in the stadium, and it felt like you were the center of attention. Very cool view. And there wasn’t gonna be a bad seat in the house. Towering video screens flanked the stage, plus a giant one behind the band, ensured everyone was gonna see a great show. This made for a big ol’ multimedia event, which added to the impact of the show for me. Folks started to sidle in, beginning to really fill the place up. Next to us was a girl (Katie; 20-something) and her father (my age-ish) from Montana. They were in town for a trap shooting tourney, and just decided to come to the show. They were a hoot to chat with, and were every bit as excited to be there as we were. 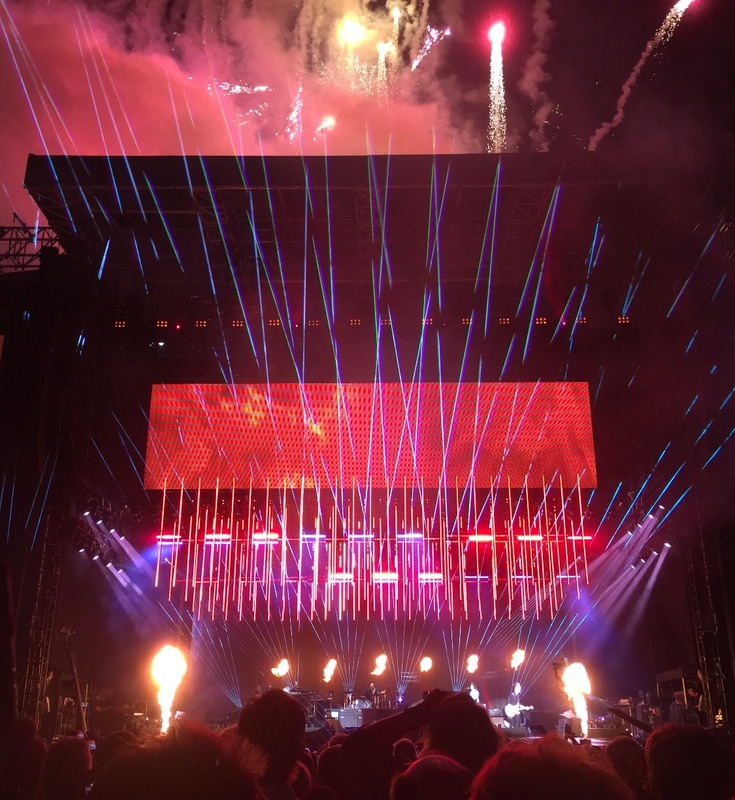 Close to 8:15, Sir Paul took the stage… and the rest was a bit of a blur. This dude is 74 years old, and played for a solid two hours and forty minutes… and then came back for a twenty minute encore! The 45,000+ folks in the crowd danced and sang along through the whole concert — me included. Anyone who knows me knows that I’m pretty reserved a lot of the time. Not here. I was singing along at the top of my lungs, dancing in place, and letting my internal hair down. It was really a wonderful night! Remember my comment about The Producers? Well, Sir Paul opened his show with “Hard Day’s Night,” which set the night in a perfect kind of motion for me. He sprinkled Beatles songs, Wings songs, Macca songs together — even one from the Quarrymen days! — and stirred them up masterfully. I can’t imagine another show you could go to that features fifty years of music woven together so well. And it seemed like he had a story to tell for almost everything he performed. So many bands just come out, play the music, and that’s that. This was like having a historian onstage, telling some choice nuggets about many of the songs, and then performing them for you. I loved that approach. Paul paid tribute to both John Lennon and George Harrison, both moving, and wonderful. And I saw something I’d never seen at a concert. 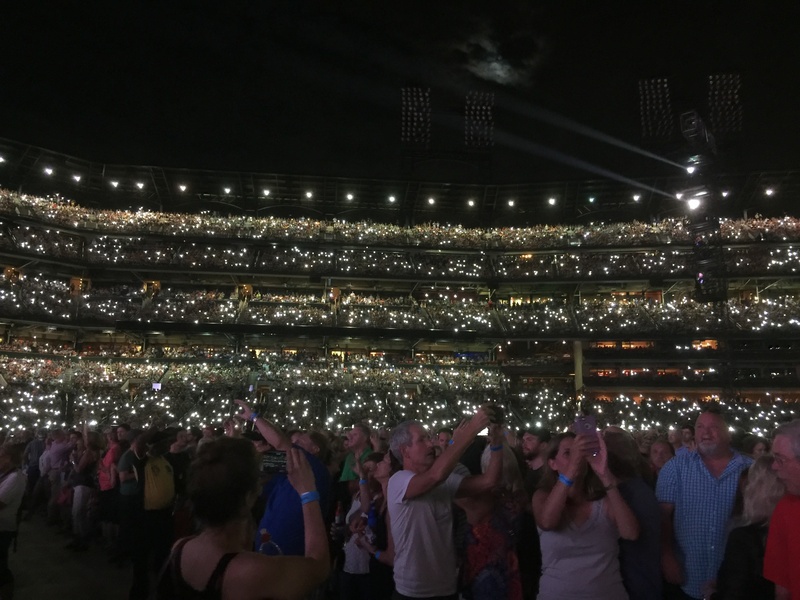 For both “Hey Jude” and “Let It Be,” the crowd lit their cell phones up, the same way we used to do with lighters a long time ago. I looked around me from the stadium floor, and it was like being surrounded by fireflies. Utterly cool. He performed “The Fool on the Hill” and “Being for the Benefit of Mr. Kite” — neither of which I would’ve bet on ever seeing live, and certainly not by Macca himself. 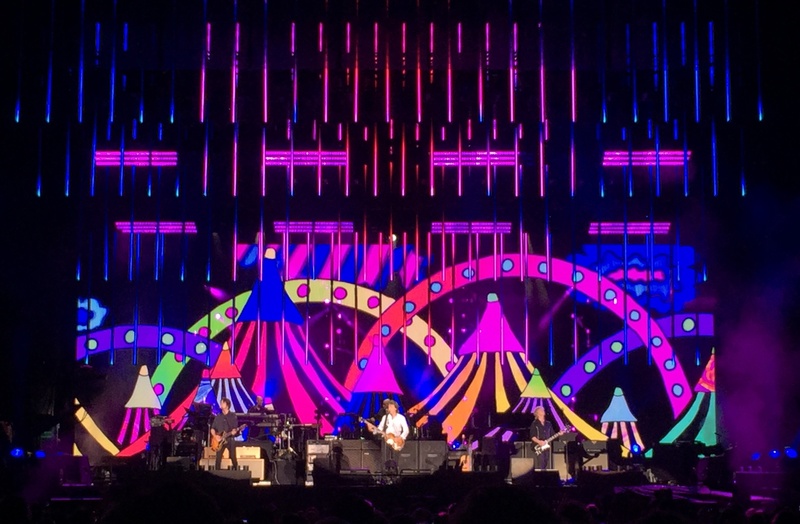 I loved the treatment for Mr. Kite — the video boards brought a psychedelic carnival atmosphere to that performance! “Nineteen Hundred and Eighty-Five,” “Band on the Run,” “Ob-La-Di, Ob-La-Da,” “Back in the U.S.S.R” … so many standout performances, and the crowd never relented (me included), singing along and dancing the night away. There were a ton of cameras and booms… I’m really hopeful that this show was being recorded, and might be made available in the future. Big crowd, big venue… I could see it happening. And if Macca comes back to Da Lou, you can bet your buttons I’ll try to find a way to go. So… we started this story yesterday with my needing only a couple of miles to finish the 10k I started Saturday morning. I was on my feet for five hours Saturday night (I don’t know why you get a seat for these things! ), and between walking the short distance to/from the car and dancing, I added five more miles. Yeah, I danced for something like four miles. 🙂 And all that dancing was definitely much more enjoyable than running, but was so very much more exhausting!!! !